Everybody, all of them, are recipients of the developmental support with which Chicago Dancemakers Forum has transformed the dance scene. That would be a great beginning for just about anything that has anything to do with dance. It’s the first of the Core Beliefs that you find if you read about Chicago Dancemakers Forum at their site ChicagoDancemakers.org. and it’s certainly a great beginning to understanding what this unique organization does, and more importantly, what they keep succeeding in doing. In this case, it’s also the beginning of DancerMusic’s PRE-View of CDF’s Elevate Chicago Dance 2018, which is an all-day, hard-to-imagine, once-in-who-knows-how-often gathering of forty-five of some of Chicago’s finest dance artists. It starts at 9:00am, Sunday October 21st at the Chicago Cultural Center (78 E. Washington St., Chicago, IL 60601) and features performances throughout the legendary downtown Chicago venue all through the day. It’s Chicago Dancemakers Forum’s way of celebrating their fifteenth anniversary, and it’s not just an enormous line-up of talent. Everybody, all of them, are recipients of the developmental support with which Chicago Dancemakers Forum has transformed the dance scene. Then, as now, dance making artists needed support, creative stimulation and interaction. Johnny Nevin: Chicago Dancemakers Forum is celebrating a remarkable fifteen years of profoundly changing how dance is made in Chicago, and who gets the opportunity to make dance in Chicago. Can you tell us a little more about this remarkable history, and about the inspiration behind your work? How did all of this lead up to Elevate Chicago Dance, the day-long celebration of both the anniversary itself and of many of the accomplishments of your first fifteen years? Ginger Farley: Chicago Dancemakers Forum (CDF) came into being in 2003 to address concerns that talented dancemakers in Chicago were atrophying or leaving town just as they were beginning to develop their mature voices. It was conceived through Chicago Community Trust’s “Excellence in Dance Initiative” which brought together leaders in the field to identify challenges and possibilities. They provided seed funding for some experimental demonstration projects to boost dance in Chicago. Chicago Dancemakers Forum was one of those projects. Originally designed to be a short-term stimulus, CDF has continued and grown, eventually becoming a 501c3 organization. Then, as now, dance making artists needed support, creative stimulation and interaction. The CDF Lab Artist program provides just that. Each year up to six artists are selected to receive a grant of $15K combined with a year of mentorship and collegial interaction. It’s going to be a packed day with performances, installations, workshops and discussions happening throughout the Chicago Cultural Center building. The broadly defined theme of the day explores intersections between Dance, Space, Race, and Place. The organization has always been communally held with three leading incubating arts organizations forming a consortium to support the artists and the project. The consortium now includes the Museum of Contemporary Art, The Dance Center of Columbia College Chicago, the City of Chicago Department of Cultural Affairs and Special Events (DCASE) and University of Illinois at Chicago. Each identifies a participant to serve as mentor and to provide resources to CDF and the Lab Artists throughout their creative year. Now in its 15th year, Chicago Dancemakers Forum has delivered more than $1million into the hands of artists through it’s Lab Artist and Greenhouse Programs and a one-time stimulus for dance, the Regional Dance Development Initiative. In 2017 Mark Kelly, Commissioner of the City of Chicago’s Department of Cultural Affairs and Special Events (DCASE), invited Chicago Dancemakers Forum to create dance programming on Chicago’s Cultural Campus. We are thrilled to be partnering with DCASE on Elevate Chicago Dance, which takes place on Sunday October 21st and will feature the work of 45 of those artists. It’s going to be a packed day with performances, installations, workshops and discussions happening throughout the Chicago Cultural Center building. The broadly defined theme of the day explores intersections between Dance, Space, Race, and Place. Chicago Dancemakers Forum defines dance broadly and inclusively. The Elevate Chicago Dance 2018 artists, through a diverse range of dance and interdisciplinary works, make connections with current ideas about the dynamics between race, social spaces, and personal and body histories. For artists and audiences alike, the cultural, political and architectural history of the Chicago Cultural Center building is a powerful setting for these relevant considerations. Thrillingly more than eighty per cent of Chicago Dancemakers Forum awardees are still living and making work in Chicago. Johnny: As one of the first members of Hubbard Street Dance Chicago, as an inspiring presence in the Chicago Dance Community for several decades, and now as the Executive Director of Chicago Dancemakers Forum, you’ve seen dance in Chicago change and blossom. What do you see now, as you look across the rich dance community here, especially as it includes so many of the artists that Chicago Dancemakers Forum has supported and inspired? Ginger: Chicago Dancemakers Forum brings the Lab Artists together, along with the consortium members, throughout the year with the goal of helping them refill their creative reservoirs and to build strong bonds with each other. The program is unique in its emphasis on artistic process and an extended period of open-ended creative exploration. The conversations between the artists bring their gloriously varied voices into dialogue with one another and are expanding for everyone. Thrillingly more than eighty per cent of Chicago Dancemakers Forum awardees are still living and making work in Chicago. The connections made through Chicago Dancemakers and our other wonderful community partners has nourished a rich and thriving layer of independent artists and small companies who are nimble enough to experiment, reinvent themselves, collaborate. It’s exciting! The long term presence of Hubbard Street and other larger companies has also contributed to the pool of talented dancers and makers and teachers. The loss of some of the mid-sized companies, while painful, has also contributed to the indie scene. It’s so different than it was 15 years ago. On any given night this week I had the choice of about three performances that I really wanted to see. This shift clearly illustrates what a long term commitment to dance and dancemaking can do. Dance is a language of the body, it takes time and a multitude of active artists to fuel the generational exchange and the pass down of knowledge through the artistic body. We want to continue to support this vigorous activity. Dance is a language of the body, it takes time and a multitude of active artists to fuel the generational exchange and the pass down of knowledge through the artistic body. We want to continue to support this vigorous activity. 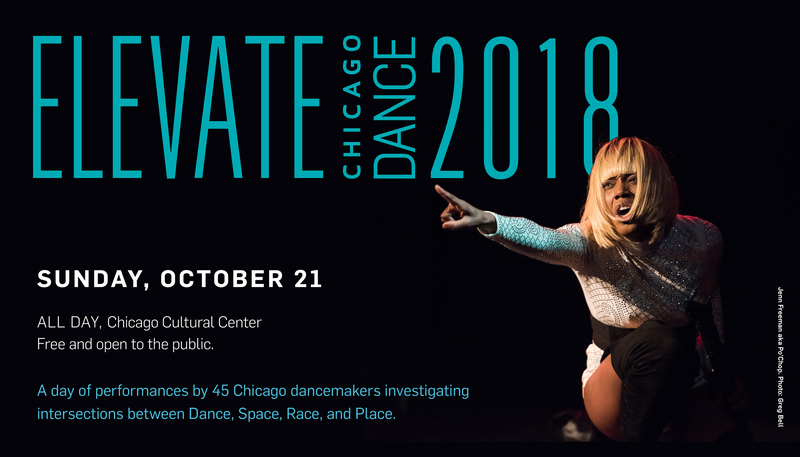 https://www.chicagodancemakers.org/ presents Elevate Chicago Dance on Sunday, October 21st at the Chicago Cultural Center (78 E. Washington St., Chicago, IL 60601), beginning at 9:00am and featuring continuous performances throughout the day (until 5pm). It’s all Free and Open to the Public — RSVP Here. Want to know who will be performing? Check out the full and amazing schedule at ChicagoDancemakers.org/Elevate.